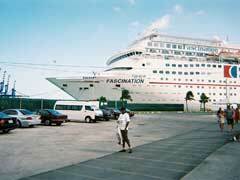 Carnival Cruise Lines offer exclusive Bahamas cruises from Jacksonville, Florida in their sailings. Cruise from a smaller port located on the upper east coast of Florida and take in the coast of Florida as you sail to the beautiful Bahamas. Carnival’s Fascination is your home away from home on 4, 5 or 7 day vacations with slightly different itineraries. For a 4-day cruise your stops include Nassau and Freeport, 5-day trips include either Nassau and Half Moon Cay or Key West and Nassau and the 7-day trips include stops in beautiful Grand Turk, Half Moon Cay and Nassau before all return to Jacksonville. Florida cruises to the Bahamas aboard the Fascination are full of fun from start to finish. The Fascination is a newly remodelled ship, with its refurbishing having been completed in 2010. They basically created an all-new ship by adding balconies, a Mongolian restaurant and the Serenity Deck, a kid-free zone where adults are free to relax and unwind, not to mention the sports deck, complete with mini-golf. They also refurbished all of the passenger cabins, all of the common areas and created a Hollywood theme throughout. Bahamas cruises from Jacksonville aboard the Fascination also include the waterworks play area, complete with giant waterslide, two pools and watery fun for everyone, as well as a multitude of diverse dining opportunities, not to mention the spa facilities and the onboard casino. If you are looking for a slightly shorter 3-day cruise to the Bahamas, Carnival, Royal Caribbean and Disney all offer sailings from Port Canaveral, located just down the coast from Jacksonville. While the things to do in the Bahamas are extensive, including swimming with dolphins, taking in the nightlife or playing in the water, there are also a multitude of things to do onboard during your journey to make your whole vacation something to remember. Bahamas cruise deals can be found on many sailings, especially if you are a returning guest, a member of the military or you prefer to book last minute to get the best rates. Bahamas cruises from Jacksonville, along with other Floridian departure ports allow you fun on the ship on your short jaunt over to the Bahamas. It is the perfect combination of cruising and playing at your destination and makes for that perfect getaway. With the capacity for over 2,000 guests and a staff of 920 with fun promised 24/7, choosing Bahamas cruises from Jacksonville with Celebrity’s Fascination gives you a great vacation at a great place from a convenient location. What could be better than that?